From the great State of Maine, we head south to the Empire State, New York. Beer #340, only 25 more to go, is Black Chocolate Stout by Brooklyn Brewery which happens to be brewed in Utica, New York. Their version of a Russian Imperial Stout has a healthy ABV of 10%. It was very dark in color…black as night. The head was small and brown. It had quite the roasted malt nose. Chocolate and booze were there in the smell along with what I though was black cherries. The taste is pretty much dominated by those lovely dark roasted malts with a slightly bitter dark chocolate flavor being the big star here. There is a bit of a coffee thing here also, slightly sweetened. And sure enough…the cherries I noticed in the nose are here about mid-drink. It was heavy and full bodied with low amount of carbonation. The alcohol was nicely hidden…even as it warmed up. It was quite the creamy beer. Super busy tonight working from home…I barely have time for beer #296, D.O.R.I.S. 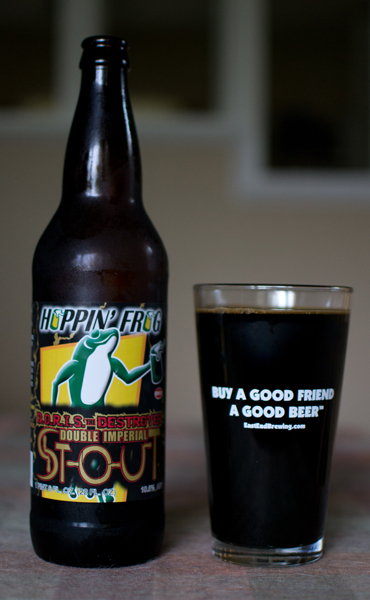 The Destroyer Double Imperial Stout by Hoppin’ Frog Brewery from Akron, Ohio. This Russian Imperial Stout has an ABV of 10.5%. D.O.R.I.S. poured black as night with a brown one-finger width head. It looked quite thick. The nose was vanilla, molasses, sweet chocolate, and a bit of coffee. The roasted malty flavor, a bit like coffee, was the big star here in the taste. The chocolate flavor here was more bitter than it smelled like. There was even a bit of a citrus hop thing going on. Alcohol was also present in the taste but it wasn’t overpowering. It finished with a burnt smokiness. The body was thick and syrupy with a bit of carbonation. It was a sipper for me as the alcohol was pretty noticeable, even more so as it warmed up. This was quite tasty. I enjoy a good Russian Imperial Stout and this is one of them although I prefer a bit more carbonation. Oh well…back to work. 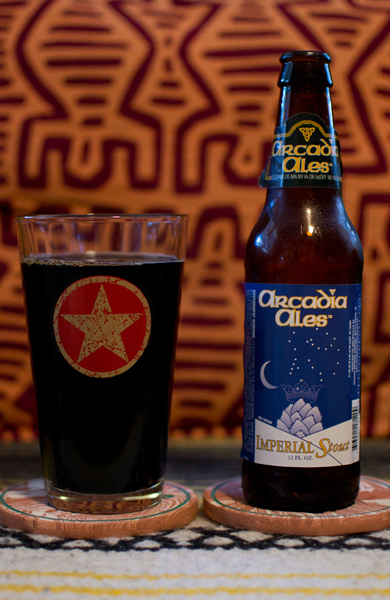 Beer #230 is Arcadia Ales Imperial Stout by Arcadia Brewing Company. This Russian Imperial Stout has an ABV of 8.4% and is brewed in Battle Creek, Michigan. This poured nice and black with no head what so ever. It kind of looked like a cola. The nose was a bit on the sweet side. I got some raisins or plums and a hint of roasted malts…think chocolate. The taste was also a bit on the sweet side and to me it resembled a sweetened iced coffee with a bit of molasses thrown in. It was a bit on the lighter side body wise with very little carbonation and was very smooth. For a beer with an ABV of 8.4%, you couldn’t notice the alcohol at all. Chillin’ by the pool eating left over tomato pie (like pizza but I think better) after a long bike ride today was where I decided to have my next beer. 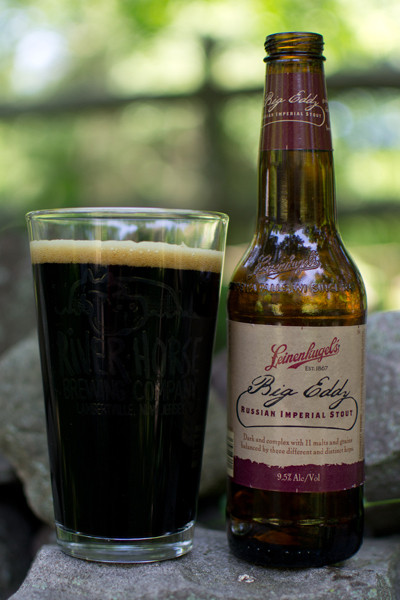 Beer #187 is Big Eddy Russian Imperial Stout by Jacob Leinenkugel Brewing Company from Wisconsin. This was really easy to drink and the 9.5% ABV was barely noticeable. Problem is, it was just an average Russian Imperial Stout for me…I have had much better beers of this style during this 365. Nothing really stands here. Onwards to beer #188. Cheers! Tonights beer comes from Rocky Mountain High…Colorado…Boulder, Colorado that is. 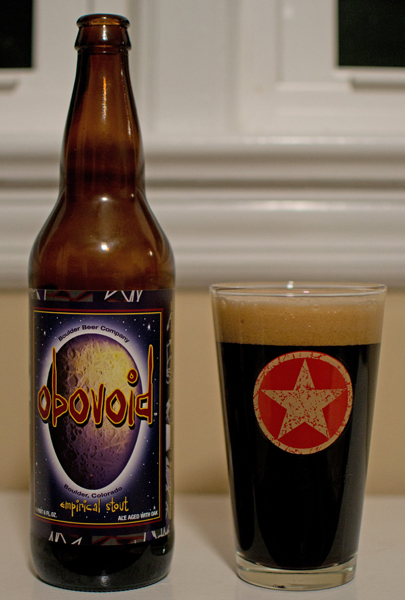 Beer #160 is Obovoid (what???) Empirical Stout by Boulder Beer. This Russian Imperial Stout had an ABV of 8%. I made an attempt to visit Boulder Beer a few years ago but when we got to the location of their pub/brewery in Boulder…it was closed. I was a bit disappointed to say the least. Travel all that way to try some fine Colorado beer and to get turned away because it was closed? How dare them. Well tonight I will finally get to try something from them and hopefully it lives up to my expectations. Obovoid (huh???) was one black beer with a nice sized tan head. The nose was typical for a Russian Imperial Stout, roasted malts and bitter sweet chocolate. It also had a bit of vanilla (I wonder if this is from the oak aging?) and a slight earthy smell. The bitter sweet chocolate (kind of like cocoa powder) dominated the flavor. There was a nutty flavor here also. The body was a bit on the light and thin side with with some heavier than expected carbonation. It wasn’t nearly as creamy as I would have liked it to be. The alcohol was hidden well here making for an easy drinking brew but it packed a punch after drinking the bomber. This was a solid Russian Imperial Stout. Looks like I will have visit Boulder Beer if I ever get back out to Colorado…which I think I will as it is a most beautiful state. Beer #154 is Raven’s Eye Imperial Stout by Eel River Brewing Company. Eel River hails from Scotia, California. 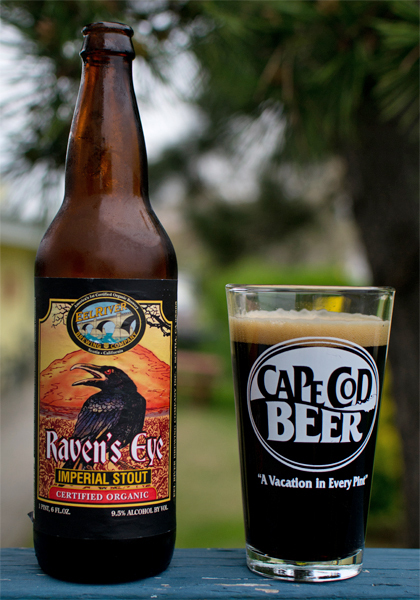 Raven’s Eye is a Russian Imperial Stout with an ABV of 9.5%. It poured black with a tan head. The nose was classic Russian Imperial Stout…lots of roasted almost burnt smelling malts, chocolate, and dark fruit…like plum or raisins. The taste followed suit, toffee, caramel, chocolate, molasses…the sort of sweet fruit was raisin for sure. It had a nice hop bitterness near the end of the taste. This was a bit on the heavy side with the carbonation being a bit heavier than anticipated. Twas a slow drinker with the heavy ABV. I liked this, I liked the label (who doesn’t like ravens), I liked just about everything about this. It wasn’t the best Russian Imperial Stout I have had but they can’t all be KingBob Approved…now can they? Budem zdorovy!!! Heathen…one who does not acknowledge the God of Judaism, Christianity, or Islam…pagan. Interesting choice for tonights beer considering it is Passover. 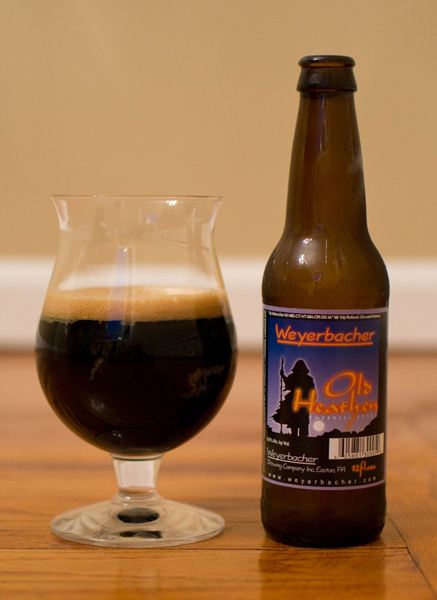 Beer #142 is Old Heathen Imperial Stout by Weyerbacher Brewing Company from Easton, Pennsylvania. This Russian Imperial Stout has an ABV of 8%. Black was the color and settling nicely on the top, was a small tan head. Bitter chocolate, molasses, and a smoky touch make up the aromas of this malty brew. 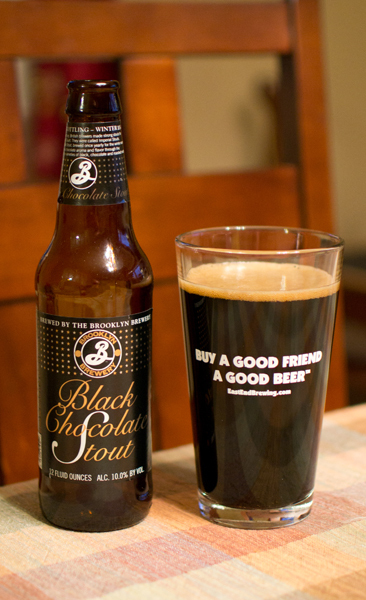 Chocolate, semi-sweet roasted malt goodness, a touch of vanilla, and a nice coffee finish are enjoyed in the taste. Smooth, creamy, not nearly as heavy as the pour suggests, and light on the carbonation make my mouth smile. 8% ABV you say…where…I can’t find it easily and that makes this quite the little drinker. I’ve been called a heathen in the past but am most certainly not. What that has to do with the price of jellybeans in Guam I will never know. This Old Heathen was a most wonderful Russian Imperial Stout. Find it…drink it…enjoy it…worship however you prefer…sing songs…touch someone (but get their permission first)…eat hearty…dance a jig…smell the roses…run naked in the rain…and so on. You get the point…or do you?? ?